Pain that feels like a sword piercing her soul is not the kind of word a momma wants spoken over her. Especially a young mom (Mary was probably 12-14 years old) who was already caught up in a whirlwind of wonder that she didn’t understand. I mean this was supposed to be Simeon’s blessing instead it sounded like heartbreak. Verse 33 says, “Joseph and Mary were amazed at what was being said about Jesus.” This was their boy, their baby. I can’t wrap my mind around how she must have felt. When Simeon met Jesus for the first time, Jesus was about 40 days old. I remember being a new mom. The excitement, the anxiety, the hormones! 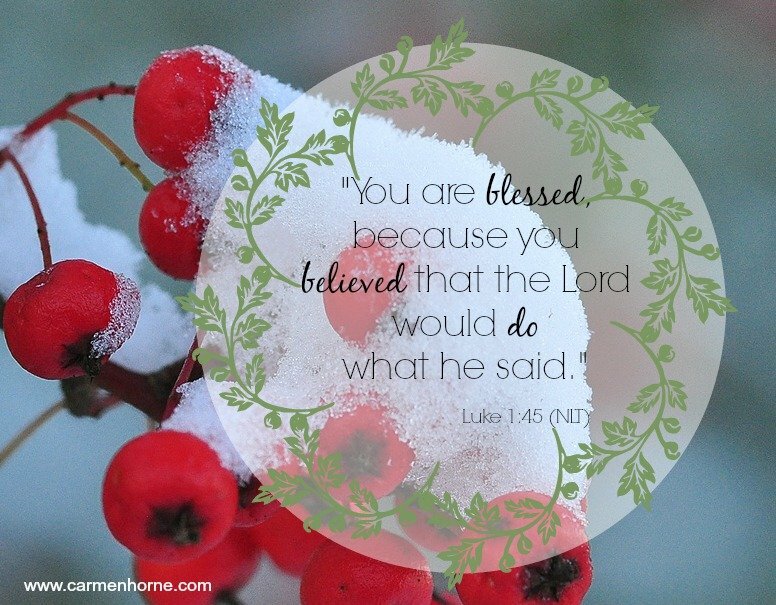 It’s easy to sit Mary on the highly favored pedestal – because she was. It’s a little harder to see her as a woman like you and I. When Gabriel first greeted Mary, we see her feeling the same way we would have felt – “Confused and disturbed, Mary tried to think what the angel could mean.” Oh my word, I can just imagine there were many days of bewilderment for Jesus’ mom. As she progressed through her pregnancy, Mary surely dreamed of life with her new little family. Through all the struggles they most certainly faced – the unusual place she and Joseph found themselves – she smiled as she pondered all these things in her heart. She after all, was going to be a mommy. Don’t you know she never forgot what Simeon said. She remembered the encouraging prayer he prayed as he held her baby, “I have seen the Savior you have given to all people. He is the light to reveal God for the nations, and he is the glory of your people Israel!”. She also never forgot the prophesy he spoke. I know she never forgot, because I would never have forgotten. Mom’s don’t forget those kind of things. Many of us today still dedicate our babies to God. Our little girl was dressed in white, smiling and cooing at her grandpa one Sunday morning 29 years ago as we promised to raise her in a godly home. I understand wanting your child to make a difference. To be a light. Mary and Joseph wanted no less for their little one. Mary knew this child would be different. Even if Joseph didn’t understand a lot about it, Mary knew. She may not have understood the gravity and depth of the road her baby boy would walk, but she knew He would walk it like no other. My mom once told me that our children “will give us our greatest joy and deepest heartache”. If Mary and my mom could have visited, Mary would have certainly agreed with that statement. After all, Mary was a momma too. Dear Jesus, As we make our way to the day we celebrate the birth of You, our Savior, help us remember this is not just a story in a pretty little children’s book. This is real life. Everyone had real life feelings and real life emotions. Thank You Father God that You chose simple folks to use in such an extraordinary way. It helps us remember that when we are willing, we too can be used in ways we never dreamed. As Mary said, “I am the Lord’s servant, and I am willing to accept whatever he wants. May everything you have said come true.” May you say of us Lord, “You are blessed because you believed that the Lord would do what he said.” We love you Lord. Mary knows the mother’s heart in all of us. I find that so comforting. There were times when my child was very ill that I felt like she might be the only woman who I could relate to. I found companionship in talking to her mom to mom. Jenni I cannnot imagine how you felt fighting for your child’s life. There must have been times you felt so alone and scared. I love how God placed everyday people in the Bible to help us walk the path during those lonely times. Mary must have been a wonderful mom. If she wouldn’t have had that potential, God would have never chose her. Once again, He took the ordinary and made extraordinary. I sure am glad you stopped by. Merry Christmas! Merry Christmas Betsy! Simeon’s prayer is so beautiful. Just what we want to hear as a mom. The Gospel of Luke recounts the birth of Jesus so beautifully. I think I began to love it best when I fell in love with Linus reciting it in “A Charlie Brown Christmas”. One of my favorites! This is so beautiful, Carmen! So glad I stopped by this morning! Merry Christmas! Karrilee, I’m so glad you visited too! I always love seeing your beautiful smiling face in a link up. Thank you for your kind words of encouragement. Merry Christmas! Carmen, thank you for bringing this story into a new light for me today. Yes, she was a mama too and how easily we forget that. I can’t imagine what she must have been feeling in all of these moments. Praying that God continues to reveal himself and his story to us in new ways. Thank you for sharing.